His face blackened and helmet coated in soot, Hussein Saleh watched the oil fields of his home town in northern Iraq burn, belching up thick smoke that blotted out the sun. Dozens of fellow workers and engineers from Iraq’s North Oil Company, wearing dirty jackets and overalls with scarves wrapped around their faces, started up their water tankers and bulldozers for the day’s work. Their job: to extinguish and cap another oil well that Islamic State militants set ablaze when U.S.-backed Iraqi forces drove them out of Qayyara in August. “I’ve worked in oil for 30 years and I’ve never seen anything like this,” 57-year-old Saleh said, standing close enough to the flames to feel the heat. “Daesh (Islamic State) just put explosives on the wellheads and blew them up,” he said. The men work in large teams to reduce the blaze, contain the fire and then cap the well. Each fire can take days to put out, Saleh said. Since October they have capped at least seven or eight wells, with more than a dozen more to go. But the work has been dangerous. On top of the fires and the potential for inhaling toxic smoke, the area is still being cleared of Islamic State booby traps and landmines. Qayyara’s burning oil fields vividly depict the destruction the group wrought on northern Iraq, as Iraqi forces backed by a U.S.-led coalition battle to drive the jihadists out of their stronghold in nearby Mosul. Islamic State has made hundreds of millions of dollars through sale on the black market of oil from the fields it captured in Iraq and Syria when took over swathes of both countries in 2014, according to U.S. government estimates. It has suffered a near collapse in oil smuggling revenue, however, since losing control of a series of oil fields in 2015 and 2016. In Qayyara, the job of cleaning up the mess has just begun, and is slow and challenging. “We use water, earth, everything we can to control and reduce the blaze, and it’s a big team — perhaps 150 people working on one well,” supervisor Ahmed Hidayat, 54, said. “Earth is bulldozed over the burning oil surrounding the well so we can get close to it, and then when we’re close enough we cap the well. On Wednesday the men prepared to cap another well, spraying water onto the fire that turned the black smoke white. 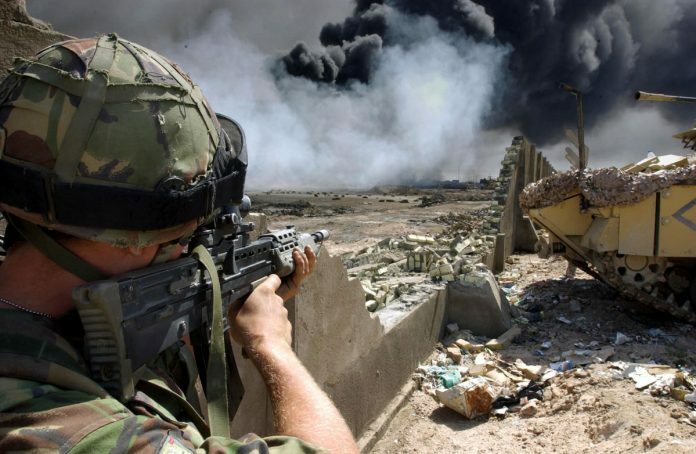 As they did so, an explosion rang out close to the well – a controlled detonation by Iraqi sappers of an Islamic State IED. “There were mines laid around the wells,” Saleh explained. 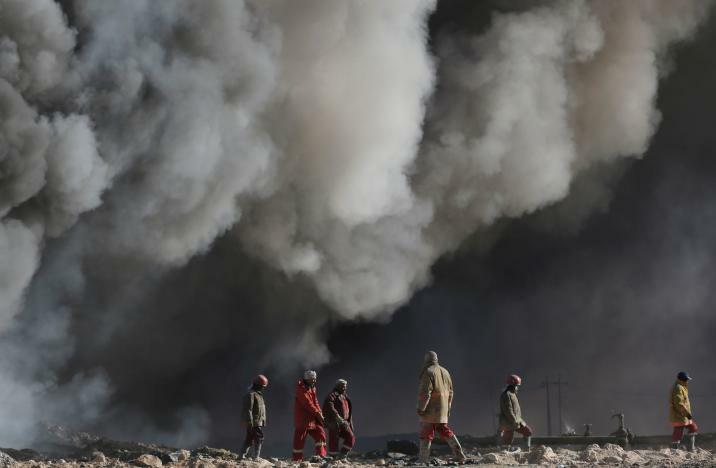 Sabah Ali, a worker from another oil-producing town northwest of Mosul, said he was worried for his health because of prolonged exposure to the fumes. But the men, some of whom haven’t worked for two years because they lived in areas under Islamic State control, say they are happy to be receiving their wages again, plus danger money of around $50 a day. Saleh said he also felt a duty to his town and country. “People should work for the good of their country. Daesh has destroyed the country, destroyed the people, destroyed Islam,” he said.